Associate Professor Jamie Seymour or the “Jelly Dude from Nemo land” has been researching and working with venomous and dangerous animals for over 20 yrs with his present interest being “Why do animals have venom?” Based in Cairns, in Northern Australia, an area that has an over abundance of venomous animals, he is uniquely placed to study the ecology and biology of Australia’s venomous species. He teaches at all levels at James Cook University, one of the top 5% of research universities in the world with his favourite subject being “Venomous Australian Animals”, a subject designed and taught by this effervescent academic. He has been successfully involved in programs designed to decrease the envenomings of humans by jellyfish, namely in Australia, Timor Leste (for the United Nations), Thailand and Hawaii. 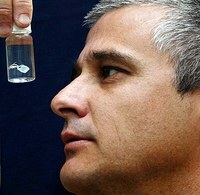 His research has been directly responsible for changes in the present treatment protocol for Australian jellyfish stings. He established and is the director of the Tropical Australian Venom Research Unit (TASRU) which is now recognised as one of the premier research groups in the world for the studies of the ecology and biology of box jellyfish and research into medical treatment of box jellyfish envenomings. His research now also covers the mechanics of how venoms work in envenomed prey with the goal of understanding why venoms are often quite complex. This has led to research into novel compounds from venoms for use in the pharmaceutical trade and he has developed strong research links with Boehringer Ingelheim in the USA.